How much does your restaurant experience depend on the particular waitperson who serves you? Having grown up in Perth I had been conditioned to accept below par service everywhere except the best restaurants. The more I dine around the world I realise my idea of better than average service is still less demanding than most others. I recognise there are a lot of brilliant waitstaff around Australia who have continued to change what I expect from a great experience. Most brilliant waitstaff are still working at the best restaurants – not necessarily always the most expensive but often the trendiest, with an element (or several) that excites and motivates them to excellence. Tonight at Baveras we need an injection of life because we’ve been driving and having fun all day and now need sustenance, but Geelong is generally closed. It seems almost every fish and chip shop is either closed or has already closed, and the one we’ve found on urbanspoon does not even exist any longer! Like a shot of adrenaline we are given the warmest greeting, and after explaining Mick had called ahead ten minutes prior, we were even congratulated for taking the time to make a booking given the kitchen ordinarily closes at 8.30pm on a Monday. Sure, we were easy to please on account of our hunger and the fact that three out of four of us ordered battered flathead tails and chips, but there was something infectious about our waitperson’s enthusiasm, making what could have been a bland experience, something better. 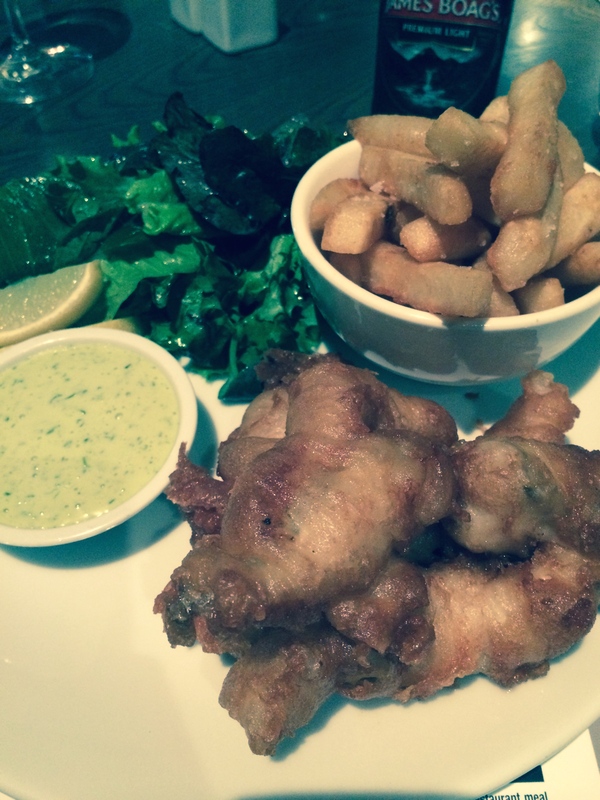 The fish and chips themselves were excellent. Four flathead tails in a nice crisp beer batter that were evenly cooked and meaty enough to taste the fish. The chips were better than average and the side salad was quite nicely dressed. It’s a very nice venue at the end of the pier but that does translate to the prices which are about as much as you would think about paying for such a dish ($30). The fourth member of our party had significant menu envy. The risotto of the day consisting of “goat’s cheese and tomato” somehow tasted overtly smoky but none of us could work out how. To say it was not the chefs best effort is an understatement. I wish I hadn’t tried a spoonful. All in all Baveras is a restaurant in a beautiful location at the end of a pier, with decent food, and at least one terrific waitperson who left us all with fond memories of a dinner at the end of an amazing day along the Great Ocean Road to the Twelve Apostles. On our way to the Twelve Apostles I’d been given strong instructions by an Aireys Inlet regular that there are three main places to stop on the way. The first, A La Grecque, I knew about as it has been acclaimed for some time, but was not the quick lunch we were looking for. The third, The Wye River General Store, was a bit far for the time of the day we were looking for. The second was just right! I hadn’t been to Bottle of Milk on previous trips to Lorne and I have no idea why? 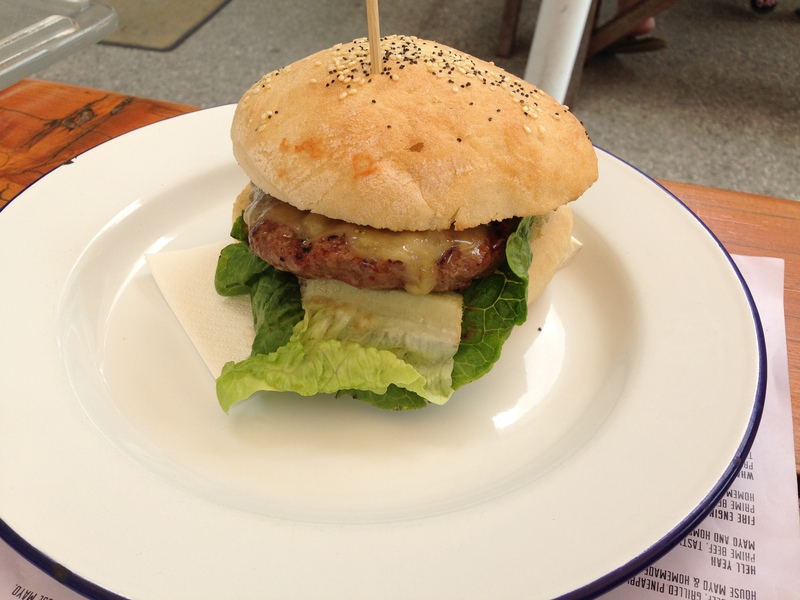 It is a good looking, broad fronted burger joint, with Seven Seeds coffee. I can only imagine it has changed over time or I was blind! In any case, it was the perfect place for lunch today. The menu is displayed at the entrance on large signage and once ready you order at the counter. The burgers are true to both the countryside and 2008 when it opened. Nice big juicy patties, traditional sourdough buns and tasty trimmings including lettuce, tomato, onion, house made mayo and homemade tomato relish. Obviously our cheeseburger contained a further key ingredient. The chips on the side were terrific with the caveat that the four of us could have shared one instead of two. The Seven Seeds espresso I tried was well made for a burger joint too. Something that particularly surprised me was how busy it was on a Monday for lunch. Even so the wait time for burgers at the height of lunch was more than reasonable, and the chips came first which is a nice touch when you’re hungry. Bottle of Milk is a top place to have a quick feed and the next time I’m in Lorne for a holiday I’m sure there will be multiple encounters. Being a conscientious imbiber when driving can be a challenge at most restaurants. All too often you are kept to a couple of glasses of wine at the most even over a lengthy meal to be safe. It goes without saying that safety comes well and truly first over another glass. While tonight is a big night, it is also a Monday and the balance between the inconvenience of getting a couple of taxis (and having an extra glass or two), and being responsible, is skewed to the latter. That leads me to the first reason I love the Carlton Wine Room. Several diverse wines are offered not only by the glass, but by the half glass, providing an opportunity to have a Champagne toast, and three other half glasses over a three course meal without any worry about getting home safely. What adds to the diversity of the wines on offer is the skill of the Sommelier in matching the wines available to different dishes, and being able to describe in intricate detail the reason they should pair well. All this without any pomp; just a great deal of passion. The Champagne toast was with non-vintage Phillipponat Brut Royale Reserve. The first time we’ve tried this house from Mareuil-sur-Ay, we were taken with the elegance, it reminding Catherine of Billecart. The choice between the entrees, and the mains, is really difficult with several enticing options leading to amiable negotiation. After two years of marriage it was nice to see we could achieve agreement with Catherine ending up with the pork belly and dory, and I with the scallops and duck. 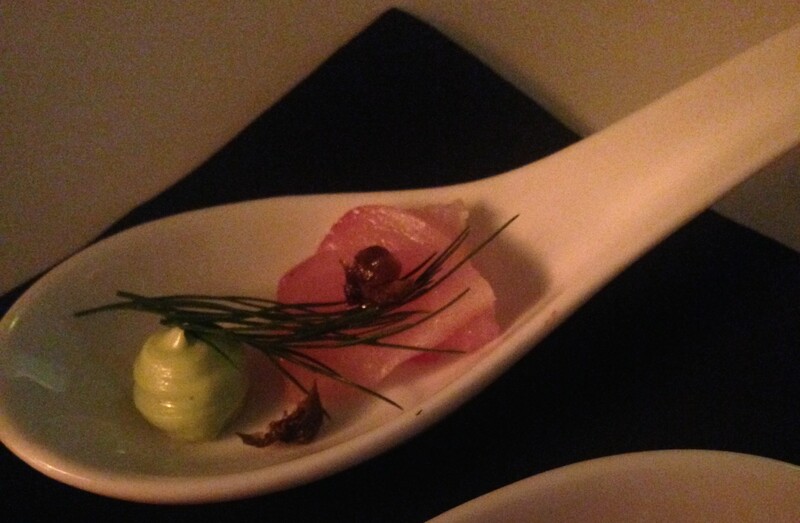 Once we’d decided we were presented with an amuse of kingfish that was a texturally balanced and subtle introduction to the finesse of the next three courses. The minute my grilled scallops arrived I thought Catherine might be envious but it turns out her pork belly was so perfectly cooked that there was complete and uniform satisfaction. The pork belly’s crackling was beautiful, elevated by the tenderness of the belly meat, and accentuated by the gorgeous apple puree. My scallops were nicely cooked with good caramelisation, but the chorizo, whilst starring with its flavour, probably needed to be slightly more thinly cut to promote the delicate flavour of the scallop. 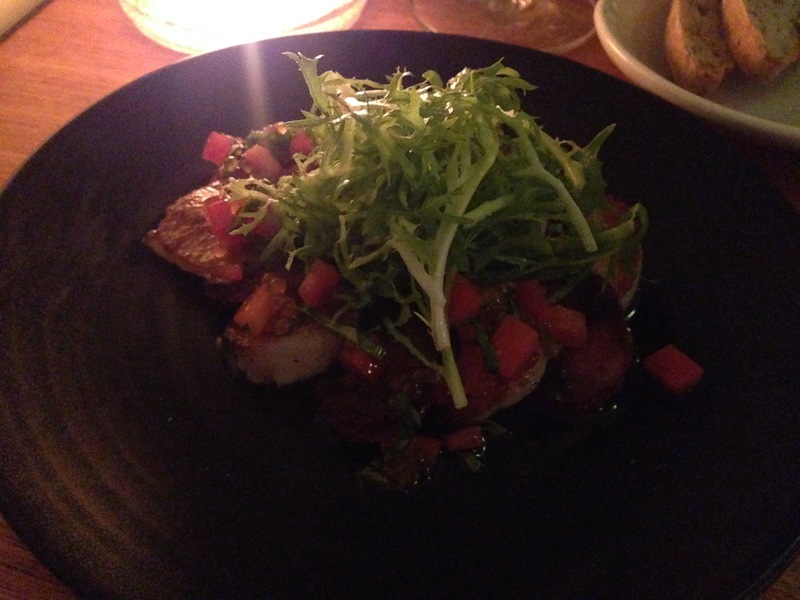 It was a great dish though, and with six scallops, is one of the better value entrees I’ve recently eaten. Having raved about Tahbilk Marsanne, luckily the Sommelier agreed (and knew a great deal more about Tahbilk’s old vines than I did), and gave us a taster each of the 2007. As expected it is a tremendous wine, almost waxy in mouthfeel, but still with plentiful fruit, showing it could age for many more years (and does). However, we were directed to the Dexter Chardonnary from Mornington for Catherine’s pork belly and to a wine from the Loire Valley by Pierre de La Grange for my scallops. They were both great, but particularly the chardonnay with Catherine having another for her main. 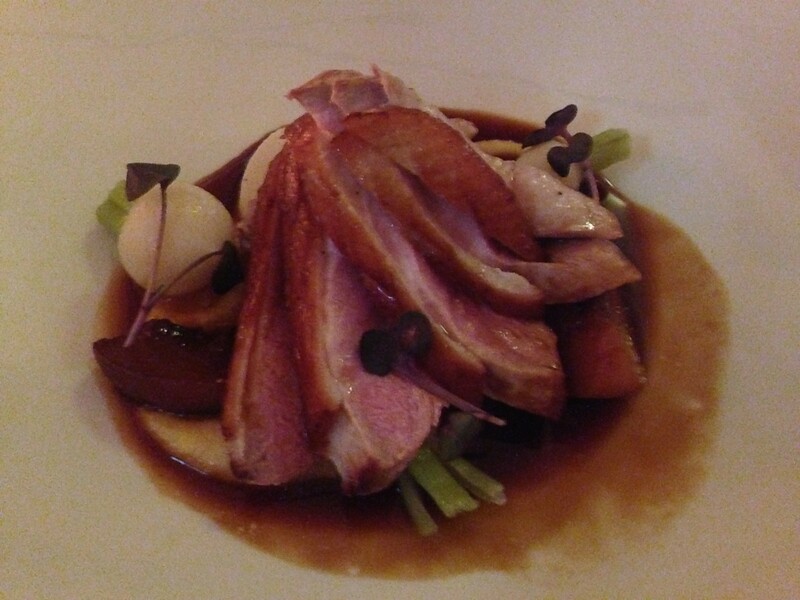 My roasted duck breast was impeccable. When combined with the turnip puree, port jus, and grilled peaches, it was even more amazing. As if the dish wasn’t good enough, the 2005 Powells Cabernet Franc (Macedon Ranges) had just enough body and fruit for the duck, with softened tannins from its age, and an elegance that is so rarely available by the (half) glass. Catherine’s dory, while nicely cooked, was not as exciting as the duck, but was beautifully presented and showed technique with the elements combining well, especially the smoked avocado. Agreement was going to be close to impossible for dessert. It is not like we were still hungry, having also shared some expertly baked bread containing herbs including thyme, and a side of fresh and sweet sugar snap peas. 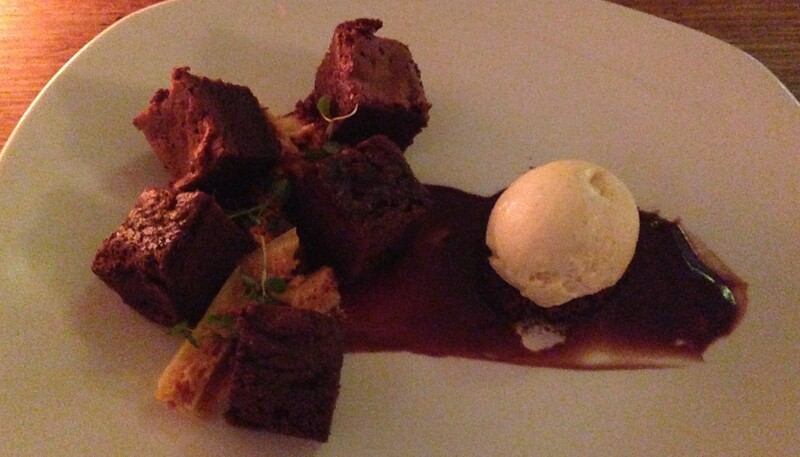 However, we both ordered the chocolate sponge, coffee, vanilla bean ice cream, and honeycomb. It was the right move, with all elements of the dessert absolutely beautiful and even better when combined with the coffee sauce bringing it all together. If sharing, it is a must to get an extra scoop of the ice cream because the sponge while not dense like a brownie, is still rich. Best of all, there was enough honeycomb to have a little with each bite. The restaurant would have been a house in a previous life and has a comfort and feel of those times. There is an intimacy on the one hand from the candlelight and some of the finer elements in the decor, and on the other hand an atmosphere that only bistro style dining can bring. The service is skilled, but equally relaxed and quietly confident. It is these elements, the incredible wine options, and the number of great dishes competing for airtime that puts the Carlton Wine Room on my list of restaurants to repeat quickly. Swan Street Richmond is a hot address for a restaurant in the past year. Without mentioning the many openings, Swan Street now boasts (in no particular order) Fonda, Demitri’s Feast, Meatball, Union Dining, Noir, Botherambo, and so many others. One of the restaurants that started the trend towards Swan Street is Meatmother. Replacing a Middle Eastern style cafe that was on its last legs despite very nice owners and quite good food, Meatmother was planned in intimate detail, turning a dilapidated two storey into a good looking, sleek bar and restaurant that is dark and inviting. 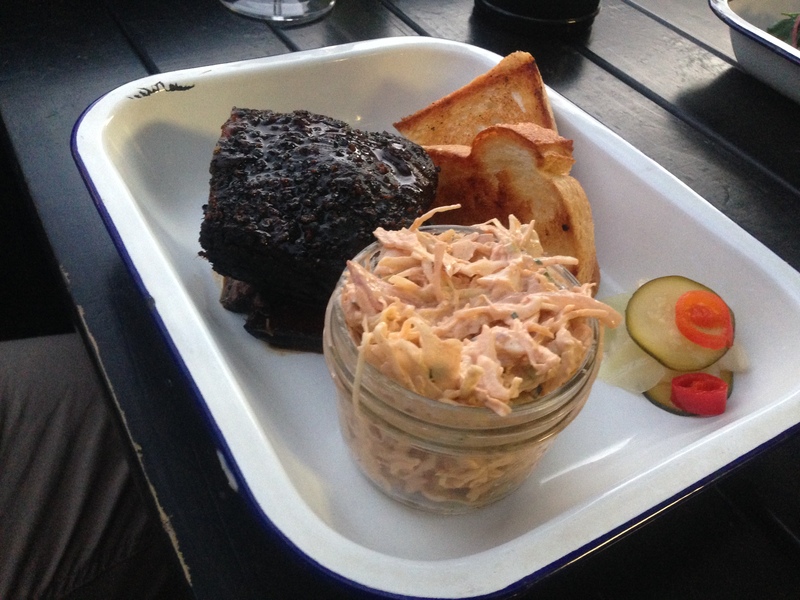 From day one the script was great quality slow cooked meats, and a top range selection of bourbon. Reading between the lines, part of the script was also affordability to the locals who at first were lining up to try the indulgent offerings. These days affordability has slipped as a result of economic forces I like to call demand and supply! It seems the restaurant is simply too small and busy to continue to charge about $20 for a tray of meat and a side. Today it is more like $26 which is not as competitive. While it will be interesting to see the impact the higher prices have on the restaurant, I have to write about it on its merits and price is only a small part of the equation. 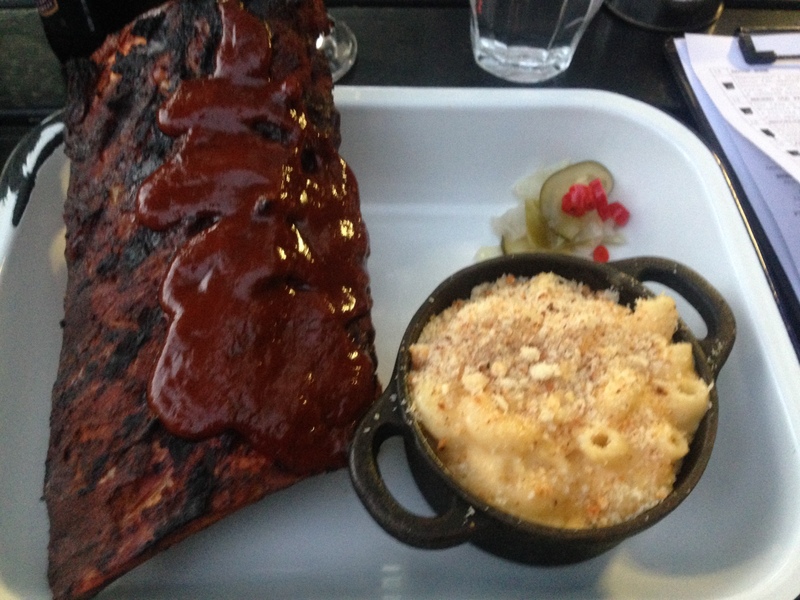 My spare ribs and side of mac and cheese are excellent. The barbeque sauce stands out for flavour on the ribs, really adding some spice and depth. The ribs are tender. Easy to eat (you definitely need to pick them up!) and a great amount. The mac and cheese is a guilty favourite that I rarely can go past. One of my friends has the chargrilled flank steak, which I don’t recommend, more because this is a restaurant where slow cooking is king, so a minute steak is the complete opposite. My other friend has the pasture-fed beef short rib which falls off the bone showing incredible tenderness. He enjoys his meal, but doesn’t rave about it. Trying the meat for myself the distribution of fat throughout is beautiful and the tenderness is compelling. Meatmother has eager staff who know they are working in a trending restaurant. They take an interest in explaining the meats on offer and the good selection of drinks including several boutique beers. It is the whole package and has developed a large following, showing the majority of punters enjoy what they receive. The daily rotation of places for lunch is largely unscripted and hectic. Venues almost choose themselves based the past experiences of those around for lunch on any particular day. With tens of appropriate options in Richmond near work it is a difficult task to get a frequent gig. Lumberjack has moved its way into a regular spot over the past six months. There is not one particular reason for its featuring more and more regularly but it goes to show that it is possible to break through! What I like about Lumberjack is the lack of fuss, or more fairly, the perceived lack of fuss. There are basically no descriptions in the busy lunch display, so naturally our first contact with staff is immediate to get the rundown of what is in the cabinet. The usual offerings include frittatas, tarts, patties, focaccias (chicken snitzel, chicken and avocado to name a couple), wraps (chicken and corn being one I’ve tried), slow cooked (or quickly cooked but marinated) meats, and some great salad options. That is in addition to the regular menu. While the friendly staff might seem laid back, there is rarely a wait on food (as should be the case), the coffee is well made and quickly delivered, and generally the space both inside, out front, and out back is comfortable. The only exception is some of the random slight bottomed chairs that would be an interesting task for some good eaters. To the food. Personally, I think it is important to ask questions to understand exactly what you are getting because it changes regularly and is not obvious for some dishes. If you order well, I think most of the time you will get food that is flavoursome and different to many other options in Richmond, in good quantities, at very reasonable prices. I’ve found the focaccias and wraps to be particularly good. 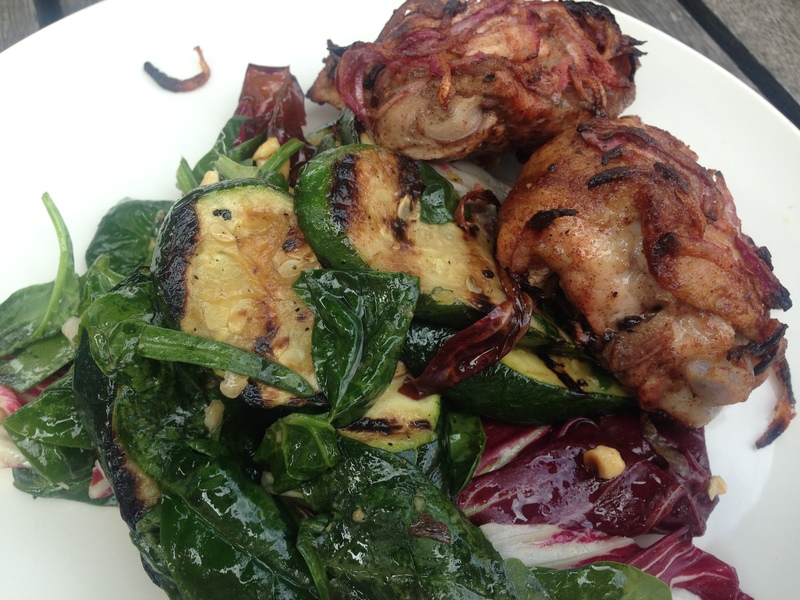 If you go larger, for an example, my chicken (pictured) covered in shallots and a spice rub, with one of the better salads I’ve had around Richmond featuring grilled zucchini and radicchio, was both delicious and less than $15. On the other side of the scale, some of my colleagues patties have been a bit plain, so they’ve chosen differently the next time around. Lumberjack has made a good impression over a length of time, but is equally worthwhile for the odd visit here and there for those outside the area. Chefs say all the time that “less is more”. It is obviously a figurative phrase that is probably better said as “focus is the most important ingredient”. To add a diner’s perspective, there are not many pared back menus that have focus and intelligence that I don’t love. I can be easily confused. But walking into some restaurants and reading the menu I can be sure that the owners have not first determined the strengths of the chefs and based the food and accompanying aspects around it. More and more focus is becoming a feature. 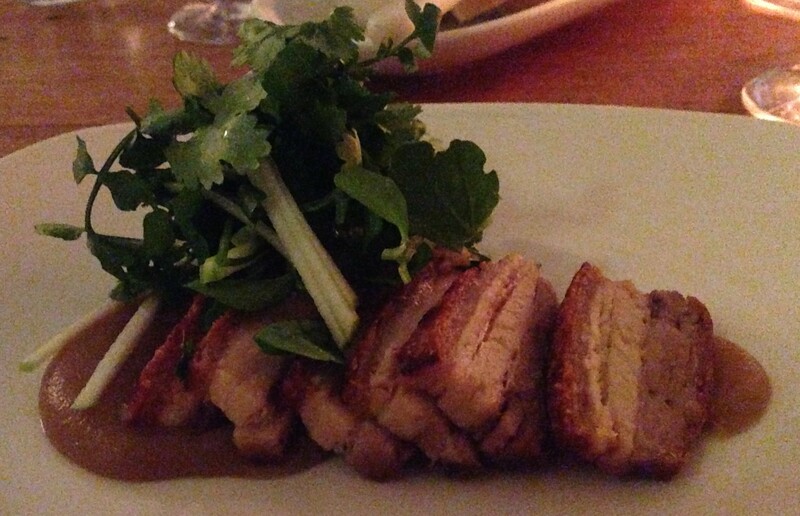 Small, carefully crafted menus, that everything else about the restaurant is derivative of. In years it will not be the exception but the rule, resembling the same way seasonal produce became the norm. It started with blackboard menus that by their very nature are temporary. It has now developed into restaurants, not just surviving but thriving, doing hundreds of covers a night, where before you couldn’t guarantee a crowd so you had to make do with the corner take away joint. Think of souvlaki stands. Now the equivalent is a Jimmy Grants or the slightly fancier Gazi. Think what places like Hunky Dory have done to the corner fish shop; or Fonda and what it has done to our version of “basic Mexican”; not to mention the number of burger joints serving up greatness making the chains unnecessary from most angles. This is all over a small amount of time. 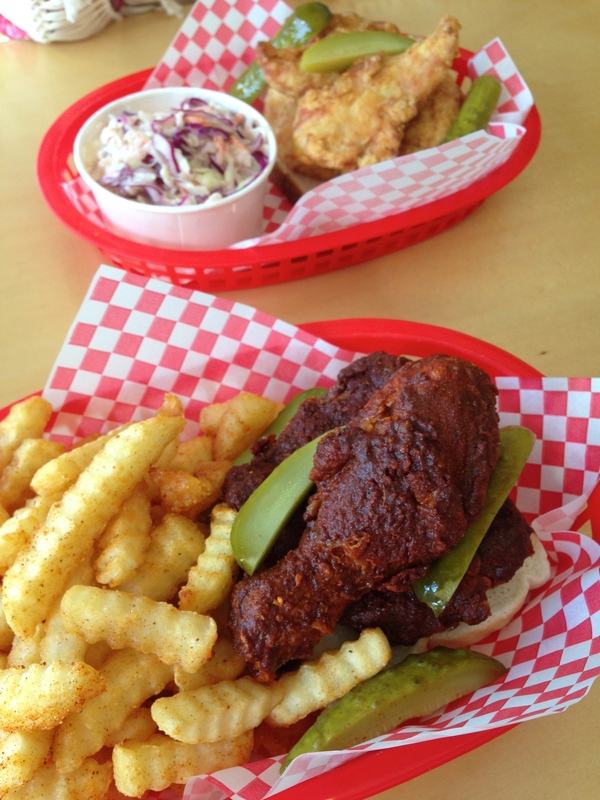 Well, the best example in recent times of brilliant focus is Belle’s Hot Chicken. It is difficult to compare the Southern fried chicken here but if you are comparing to one we all know, and some love (KFC) it is like last year’s AFL Grand Final between Hawthorn and Sydney. To explain, BHC makes KFC look worse than second rate. The menu is short and sweet, meaning everything on it needs to be exceptional. It is a choice of different cuts of chicken (along with a fish, and a mushroom option), in a sauce ranging from mild to extremely hot, with several classic sides on offer, and a few specials too. The other theme is the natural wines on offer, which is intriguing, and will be highlighted in a new bar next door (coming soon). We ordered according to our preference. There is no way to make this sound right so I’ll just say that Catherine is a breast girl and I am a leg guy! Catherine’s “tenders” done Southern (ie no heat) were still beautifully cooked and definitely true to their name. My “dark meat” cooked medium had just a steady kick but definitely added good flavour and I recommend having at minimum medium heat for this reason. Personally, I like chilli, and although I have a medium heat threshold, next time I’ll be opting for the “hot” which is the mid-point on the heat spectrum. 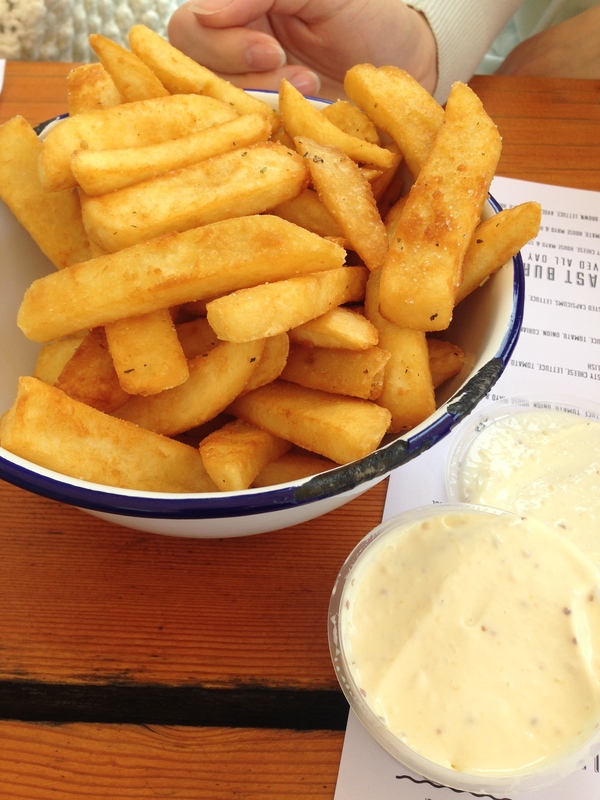 The “Old Bay fries” on the side are as delicious as chips come, and the coleslaw was nice too, although a touch heavy on the mayo as is often encountered in American cooking. 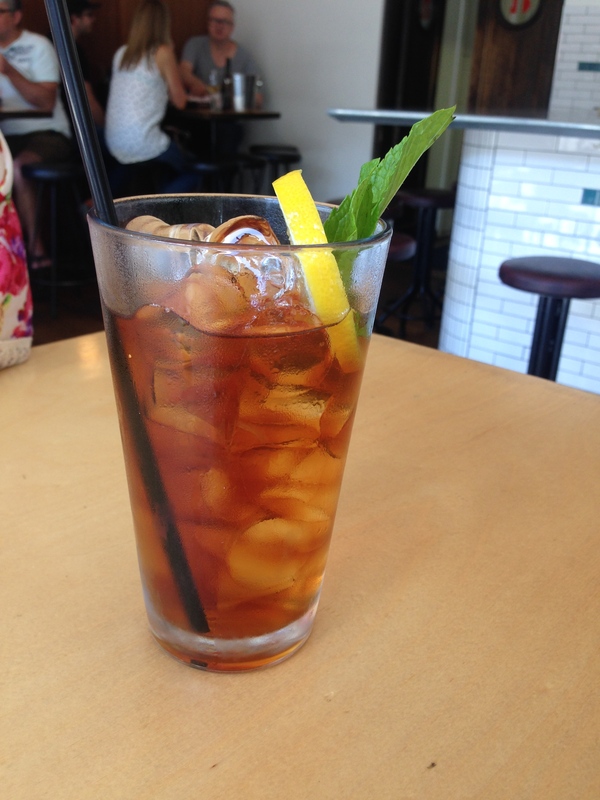 Catherine had a glass of the palate-refreshing slightly sweetened ice tea. I had a glass of the Arneis, which was viscous and acidic enough to provide a nice balance to the fried chicken, with a good amount of forward fruit. As we finished our baskets of chicken it hit me how well thought out this relatively little restaurant is, with attention to detail and striking features (namely the “diner” sign) all adding to the experience. Nothing tacky whatsoever, and definitely sleek for a fried chicken joint. Our waitperson was polished too, making light work of the many tables in her section. 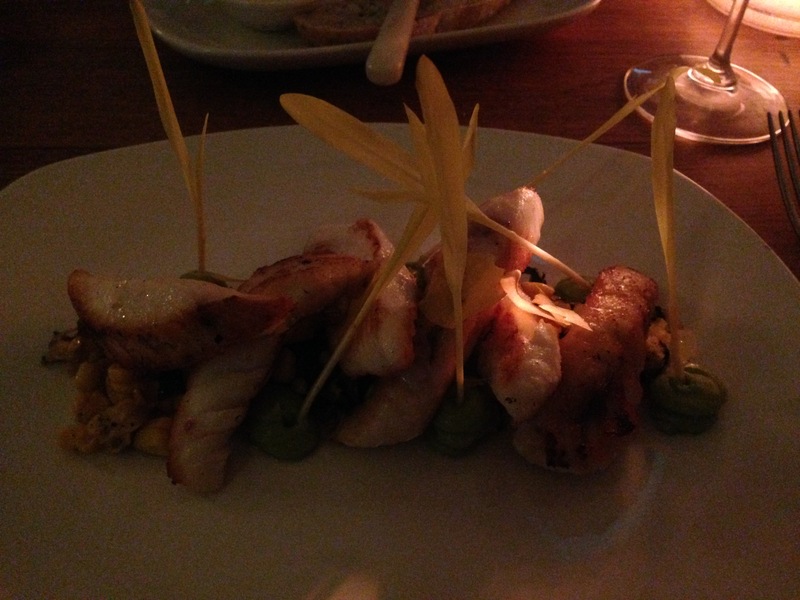 It is hard not to be impressed by everything Belle’s is dishing out. It might seem simple at first glance, but this is a fried chicken restaurant done exceptionally well.